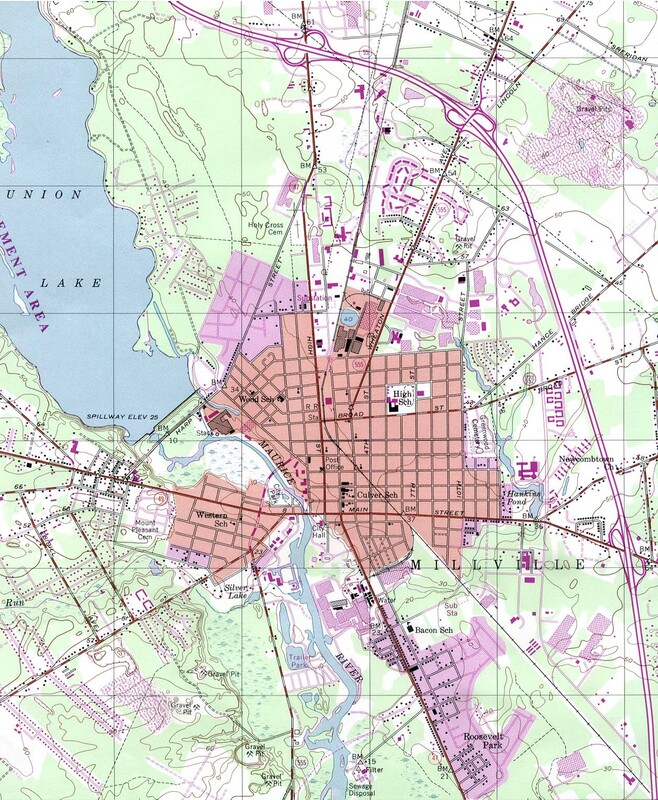 Historical – A large selection of historical New Jersey maps. Rand McNally New Jersey Travel Map – A laminated, tear-proof folding highway map. 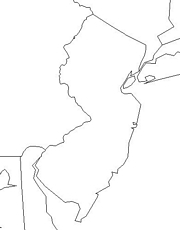 New Jersey Wall Map – A richly-colored shaded relief and elevation tinted map. Includes Pennsylvania. New Jersey Satellite Map – A photograph of New Jersey from 440 miles above the Earth. 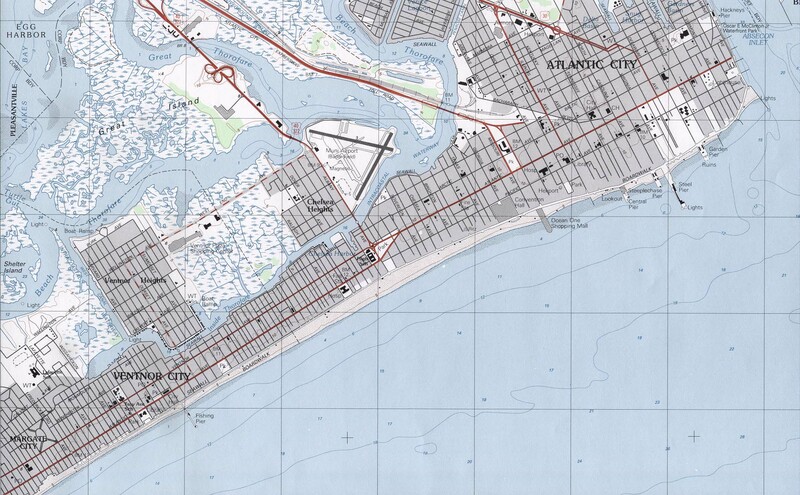 For a large selection of other New Jersey maps, click here. Explorer John Cabot in 1497 sailed past what we now know as New Jersey. 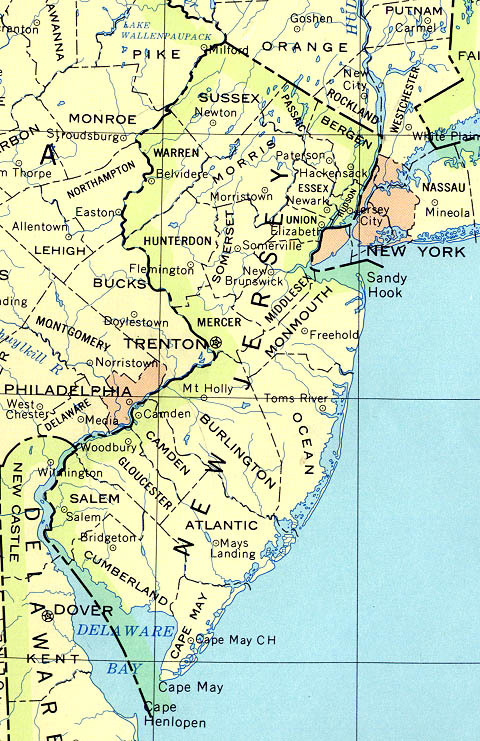 The first known European to visit New Jersey was Henry Hudson, in 1609. In 1664, England took over the colony and New Jersey came under the power of the New York governor in 1702. The colony became a state in 1787. The northern third of New Jersey is considered a part of the Appalachian Highland region, with ridges running from the southwest to the northeast. 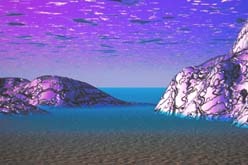 The state is surrounded by water except for 50 miles where it borders New York state. There is a blending of farmland and wooded hills and New Jersey’s highest elevation is 1,803 feet in the Kittatinny Mountains which cover the northwest corner of the state from the Delaware Water Gap to the New York border. New Jersey’s top industry is chemicals and it is a leader in the world for research centers. Important manufactured items are machinery, electrical goods, pharmaceuticals, instruments, and apparel. Many large oil refineries are located in northern New Jersey and it has the largest petroleum containment area outside of the Middle East countries. Rich farmland covers about 20% of New Jersey. The state has a high production of many garden vegetables. It also produces poultry and dairy products as well as blueberries, cranberries, peaches, and seafood. New Jersey has the world’s largest free-flying flag and the longest boardwalk in the world. Tourism is the state’s second largest industry. The largest kite-flying festival in the world is held here. The first traffic circle was constructed in New Jersey and the Garden State Parkway has 3000 acres of mowable land.